Have you ever seen someone wearing a frontal or a lace front wig, but had no clue until they revealed that they wore? Well, today you will learn how to achieve the same look by this lace melting technique. 360 lace frontal is a new design hair weaves and extensions trend. Pre-plucked 360 full lace around the entire perimeter of your head, 360 degree natural looking hairline. 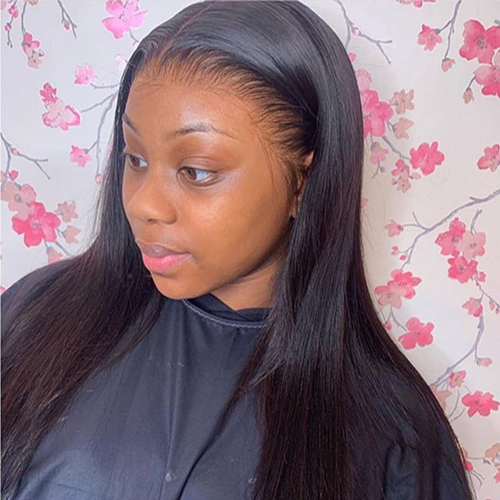 360 lace frontal is like a lace headband only with hair on it.You can greatly decrease the sew in hair weaving time using 360 frontal, you will need lesser hair wefts and Brazilian Hair for a full sew in. You will needs only 2-3 bundles to complete the full weave. How to Install 360 Lace Frontal? 1. First prepping your hair, including Bleaching knot and shampooing and conditioning your 360 lace closure. Air dry your hair closure. You can dye the lace to match your skin tone or perm your 360 lace closure to a new color. 2. Do basic straight back braid pattern for sew in. Place the 360 frontal on your head lined up with your natural hairline, make sure it is perfectly positioned along your Human Hair Wigs. Cut the lace around, leave the front part, pluck hairs from the frontal hairline, trim the lace in the front part carefully in the last. 3. Start to adhere your 360 closure by either using the sew-in or using glue-in methods to secure the front part to your own hair or to your wig cap. Then sew in the rest part. 4. Add the matching textured hair wefts to close off the opening – 2-3 Bundles would be perfect to create a full sew in weave. How To Take Care 360 Frontal Lace? 2.Always let your hair air dry. If you do blow dry your hair, do it on a cold wind setting with a round brush.Let the hair air dry completely before styling the hair again! 4.If you bleach or dye your hair, always use a neutralizing shampoo to stop chemicals from entering into the hair and use hair mask afterward to repair the hair. 6.Never brush your hair starting at the top! Always brush from the bottom up to avoid tangling and breakage!and don't brush your curly hair, just use your finger to separate the hair. When virgin human hair becomes more and more popular among black women, people are facing many choices about the hair, such as types, textures, colors, lengths etc. They are wondering which type of the hair is the best. Nowadays, Brazilian Hair and Peruvian hair is two types of the most popular virgin remy hair on the market. But how to choose them, it is asked so frequently. Today, we will talk about the similarities and differences between Brazilian virgin hair and Peruvian virgin hair in this article. All virgin remy hair has minimum shedding and tangling in Hair store. It is 100% unprocessed virgin hair which can be dyed, permed and bleached. Each texture can be processed in curly, wavy and straight. Virgin curly Human Hair is very hot selling for Brazilian and Peruvian in the market. Maybe you can notice a few strands of hair with different colors in the bulk. It is normal and typical of the hair like our own hair. Brazilian hair is one of the best selling hair and the most beautiful types of hair around on the market. It comes from the Pacific of Brazil and its derived in different lengths and natural colors. Brazilian hair weave has shiny looks and feels. It is known for the Human Hair Wigs, beautiful bounce and texture. The texture of Brazilian hair usually can be offered in wavy, straight and curly. Brazilian virgin hair is popular in most west-African countries. This type of the hair can be kept for a longer time with a good maintenance. Brazilian hair always can hold curls beautifully. So Brazilian virgin curly human hair also is popular. As girls, we most care about is the hair is beautiful or not, so they love the pure virgin human hair as their own hair on head. Why do so many people choose Brazilian Hair ? There are some reasons to explain the problem, maybe you will understand it. It usually takes you a long time to find the right hair, and it's worth it. Brazilian hair bundles are soft, shine and Has nature strong hair texture, can make you look more natural and beautiful. It will last for a long time. Why To Choose Brazilian Hair Bundles With Closure? Brazilian hair bundles and closure are all made 100% Human Hair that is donated by one person. You can restyle it whatever you want because the hair adds extra volume and length. This hair is purely natural, healthy, and untreated, can be Colored and styled in any way you like. Natural hair is actually covered by the Full Lace Wigs, so those styling chemicals will not damage your natural hair, your hair also has no chance to get brittle or thin. By wearing a closure, you make sure that All of your hair is protected so that this doesn't happen. 100% without head-to-tail reversal, guaranteed never knot, can be any dyeing ironing.If you choose it, you must take good care of it like your own hair, so it is really important for you to know what hair do you Want before you buy it. One advantage of buying human hair bundles with closures online is that it is cheap. Compared to other types of hair extensions before purchase, length, hair curl and natural or not. Our natural hair color is natural black, while Brazilian raw hair is closer to natural black, and other hair colors may be suitable for you. But if you want your hair to last longer and have a higher quality, you'd better buy virgin human Hair. Before choosing hair extensions types, it is very important to know the difference. Brazilian Hair and Indian Hair are very popular among African American women for making hair wigs. But many women may have the problem to chose which hair type. In fact, Brazilian hair and Indian hair are have their own advantages and characters. Knowing the quality and difference of each hair type is necessary before buying hair extensions. Brazilian hair extensions is 100% Human Hair, it is silk, smooth and shinny. Compared with Indian hair, Brazilian hair is better when facing humid conditions for causing less frizz. Brazilian hair always is the best-selling and top quality Hair type in the market. Its advantages is that Brazilian hair is durable, thick, silk, smooth and blends well with many hair textures. Given its high density, you will need less bundles of Brazilian hair Full Lace Wigs in creating a full look than if you were using other textures. Actually, the best results are achieved by using less of it. It is this density that makes them not frizz as much as the other common types of hair like Indian or Malaysian hair. It also holds curls much longer compared to Malaysian or Indian hairs. It is extremely versatile and very amazing. Indian hair extensions is 100% virgin Indian hair, the reason customers choose Indian hair is because of the hair length, softness, quality and texture. For most people, this is a good choice for hair wigs and hair extensions. Indian hair is available in straight, body wave, natural wave, deep wave, curly hair types. Indian hair is highly recommended for African-American women, create a beautiful wavy. Indian hair is soft, airy and can be easily flat-ironed and curled. However, this type of hair tends to become frizzy in humid condition, so anti-frizz products is recommended to use. Most women like to have Brazilian Hair. but our natural hair grows at a slow rate. The best way is to using hair weaves and extensions. It can be styled any style you like such as wavy, curly and so on. It is can be changed your look in a few minutes as you desire. Brazilian hair is most popular one and most women like to use Human Hair. Follow me, tell you the reasons. Brazilian virgin hair should not be treated with chemicals or dyes. The Virgin Hair is shipped in its natural colors. You can either use the hair in its natural state or have it colored once you use it. Either way, you will get amazing results. There are many doubts of Brazilian Hair users when they using the hair weave or hair wig, whether the hair is Remy hair or virgin hair, and someone also said that this hair is Remy hair, at the same time is virgin hair and Human Hair too. Actually, they have many differences which affect the quality and value of the hair. So how we can find the different of virgin hair and Remy hair ? Virgin Hair weaves are 100% real human hair that has never been altered by a chemical process. Virgin hair is the highest quality human hair available on the market. This hair is expensive, yet it does last for a longer time than Remy hair, making it worth the investment. Virgin hair extensions mean that when the hair is collected, it is collected from virgin hair donors. This means that the hair has never been chemically processed (any perms, hair color etc), never chemically treated, and comes from hair donors with long healthy hair. Virgin hair usually comes from younger women, so there are no grey hairs or split ends. When choosing virgin hair, hair donors must have long full healthy human hair. When collected, it is usually hand selected from thick, full, long ponytails. Since virgin hair collected from ponytails, of healthy non-processed hair, the hair is already healthy and it does not require any kind of additional chemical processing to make it look beautiful, shiny and soft. The term ‘Remy’ means the characteristics of the hair and the method of manufacture. Remy human hair is the most popular type of human hair due to the good quality and affordable pricing. Remy human hair is not virgin human hair. It is gathered from different donors and may undergo processing which is the main difference between Remy and virgin hair. When Remy hair is collected, the cuticles are left intact and perfectly aligned from cuticle to root creating a more natural look. If the cuticles are removed it will start to look less natural and may start tangling and shedding. It is more flexible than synthetic hair in that it can withstand heat meaning you can straighten, flat iron or even dye it. Remy hair is most often used in high-quality wigs, lace front wigs, Closure Pieces, and hair extensions.